The Best Kitchen Gadgets for a Green Life? What are the best kitchen gadgets to have in a really green kitchen? We would all like to save energy in the kitchen but we also don't want to add too much to our workload! I'm a big fan of a quality kitchen knife, a pestle and mortar and a good wooden chopping board. With these basics and the usual assortment of pots and pans most standard healthy cooking and food prep can be achieved. We all have our favourites but I'm sure most of us love to have an electrical gadget or two - I know I do! Here is a guest article on the best cookery equipment to have, including some common kitchen gadgets and some options for (relatively) gadget-free living. Wouldn’t it be great if there was a way to make small changes in our home that could save energy, valuable resources and money all at the same time? Fortunately, there is and it all starts in the kitchen. If you are anything like me, your counter top is probably cluttered with at least half a dozen appliances and countless more gadgets and gizmos stashed away in cupboards and drawers. But have you ever really thought about the “cookprint” or the amount of energy that these kitchen tools use to prepare food? You may be surprised. The good news is there are some very simple changes you can make in your kitchen right now that will make a huge impact not only on the environment but on your pocketbook as well. When using your kettle to make tea or hot chocolate, only boil the amount of water you need to fill your mug. Most people boil double the amount of water they need and therefore use twice the amount of energy required. When using pots on your stove top there are quite a few things you can do to help reduce energy consumption. Cut food up into small sized pieces to accelerate the cooking process, always put a lid on your pot when boiling liquids (also speeds up cooking) and use the burner that best matches the size of your pot to reduce heat loss. When making gravy or stock, use the leftover water from previously boiled or steamed vegetables while it is still hot. This not only saves energy by not having to boil another pot of liquid but it will add an abundance of flavor to your dish. Use the low-energy appliances you already own more often. Kitchen items like slow cookers, stove top steamers and pressure cookers consume far less energy than a conventional oven. – what I love about these new eco-toasters is a feature that is so simple but also very, very clever – a lid! Once the bread has been lowered into the toaster a lid closes over the top. By keeping the heat inside the appliance, these toasters consume 35% less energy than traditional toasters. – as mentioned earlier it is so easy to overfill you kettle and boil more water than you need. With the new eco-friendly kettles this problem is eliminated. You simply fill a reservoir chamber with water and then, with the turn of a knob, water is slowly released from the reservoir into a separate chamber allowing you to boil only the amount of water you need. There are also various temperature settings so the water doesn’t have to reach boiling each and every time. Of course there is always the option to ditch certain gadgets and appliances that could easily be replaced by manual energy-saving alternatives – and you get to work on building those arm muscles at the same time. Replace your electric knife and invest in a good quality chef’s knife instead. There’s nothing that an electric knife can do that a really sharp hand-held knife can’t – even carve turkey! Get rid of the electric can opener and opt for a manual one instead. The traditional swing-arm variety can opener works just as well and doesn’t add a dime to your electricity bill. 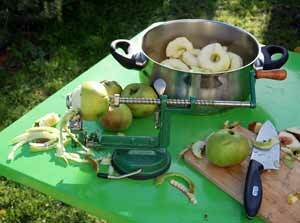 You can even scrap the electric juicer and do that by hand as well. Sure it’ll take a bit of muscle to squeeze your own oranges but think of it as an addition to your morning work out. Whether you decide to give your kitchen a complete overhaul and do away with the appliances and gadgets that are costing you money or just make a few simple changes, there is no time like the present to get started reducing your kitchen “cookprint”. Article courtesy of Moms Kitchen Gadgets – a great resource for helpful, honest and in-depth product reviews as well as tips on how to save time and money when using products like the Cuisinart Food Processor. All opinions are those of the author only. I'm a big fan of quality hand tools and gadgets. A good quality chef's knife is a real asset in any kitchen and hand-powered grinders and juicers are great because you are not dependent on the electricity supply. A pestle and mortar is terrific for grinding up herbs and spices, even if a little time consuming. On the other hand, you save time on washing up compared to when you use the more fancy types of equipment. Hand lemon squeezers are simple and easy to clean. I love the simplicity and effectiveness of my nutcracker. There are so many examples! Still, I do find a simple electric food processor saves a lot of time in food preparation, especially when catering for a bunch of guests and many of the newer models are not so very energy hungry. I also love my blender as it enables me to make loads of quality home-made soups. For pots and pans I mainly use stainless steel and cast iron. Stainless steel is very easy to use and transmits heat well. It is easy to clean and lasts practically for ever if treated well. I never use Teflon or other pans with non-stick coating. While superficially attractive, they tend to deteriorate, leaving some of the coating in your food. I've tried buying relatively expensive ones; they all do it sooner or later. Clearly, a good pressure cooker is a sound investment as it allows considerable energy and time saving. Please see Using a pressure cooker to save money in the kitchen for more on this. What is your favourite low-energy kitchen gadget? Do you have a best kitchen gadget to share? Post below through Facebook or use the quick form at Your Tips!